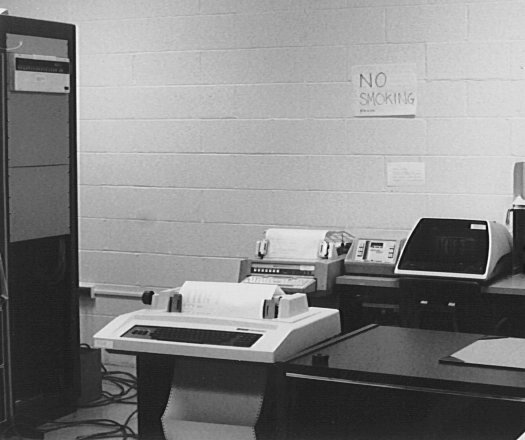 Columbia's PDP-11/50 room, 1975. The communications cabinet is on the left, with Racal-Vadic rack-mounted modems visible near the top. In the foreground is an LA36 DECwriter hardcopy terminal. In back are the GE Terminet (left), the Terminet's cassette tape drive, and a DEC VT05 video terminal. The Terminet's tape drive (which took an ordinary audio tape cassette) was supposed to be a modern replacement for the Teletype ASR-33 paper tape, and had possibilities for removeable offline storage that didn't pan out. The Terminet's print mechanism was similar to the IBM 1403 and was quite fast for its day, but also unbearably loud and prone to jam. The VT05 was an uppercase-only (and DEC's first) video terminal.